xi, 119 p. : illus. (1 in pocket), maps (1 in pocket) ; 23 cm. 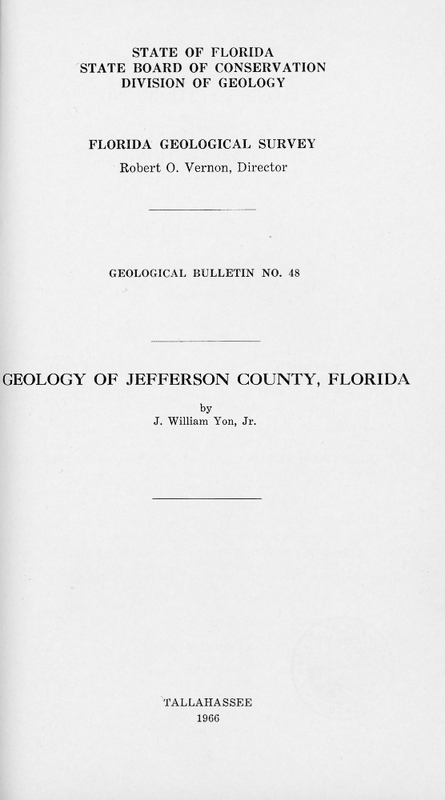 by J. William Yon, Jr.
study of the geology and hydrology of Jefferson County, Florida. logic and economic resources of the State. in an area can such minerals be developed economically. Introduction .....-- -----.. .... -- -------.. .. ....-... -....5..---------. ..
Fauna ... ..- .. .....-- ... .... --- . Pleistocene and Recent deposits ..- .. ..--.---.. Fauna -----.. -------------.-- ---------------- . Dolomite rock ----.. ....--------....... .... .....-. Artesian water ------. ..------- --....-. Hydrogen-Ion concentration (pH) ---. ...... ---- ---..-............ ..
1 Geologic map of Jefferson County, Florida. immeasurable help in the various phases of the project. S. J.
Plantation, Inc., for the many courtesies extended the writer. The writer would like to express his appreciation to R. C.
script and making very useful comments. for development of the mineral resources of the area. miles and it comprises an area of 598 square miles. direct bearing on some specific phase of the geology. of the geology, mineral resources and springs of Jefferson County. Figure 1. Map showing location of Jefferson County, Florida. not only Jefferson County but all of Florida. Figure 2. Index to Topographic maps of Jefferson County, Florida. Line, and a branch line of the Atlantic Coast Line. has 190,000 acres in farms, and the farms average 342 acres. is 73 percent or 248,000 acres. the section, the section, township, and range. The basic rectangle is the township which is 6 miles square. squares labeled "a" through "d."
will be listed only by the irregular section number. Figure 3. Well and Outcrop numbering system. into smaller units and local names applied to them. River Valley Lowlands for Marianna Lowlands. westward to the Alabama state line (Puri and Vernon, 1964, p. 10). liers, and the Western Highlands. Coastal Lowlands, and the Gulf Coastal Lowlands. Figure 4. Physiographic map of Jefferson County, Florida. Sproul, 1966) can be traced through Jefferson County. Florida-Georgia State line to the Gulf Coastal Lowlands. **^ ^ ... . .
the interglacial stages show a progressive decrease in elevations. shorelines and, tentative age are shown in table 2.
shorelines and~tentative age are shown in table 2. TABLE 2. Pleistocene terraces in Jefferson County, Florida. plain is included under the Gulf Coastal Lowlands. activity and inadequate sand supply (Price, 1953; Tanner, 1960). has a gentle seaward slope and the waters covering it are shallow. and evaluation of data obtained from the Corps of Engineers. Suwannee Limestone. Two of the features shown on the U.S.
intracoastal waterway from St. Marks to Tampa Bay, Florida. creeks and the Aucilla River. Miami (Parker and Cooke, 1944, p. 24). The Silver Bluff shoreline was extended by MacNeil (1950, p.
considered to be the Silver Bluff strandline. the base of a small escarpment. Bluff marine plain consist of mud and silts that support grasses. sand area, with a prolific stand of cedar, palm, and pine trees. tern Jefferson County may have formed as on offshore bar or shoal. oak, hardwood, and pine trees are very common on this surface. parallel to the Wacissa River, is probably a Pamlico dune (fig. 4). are believed to have been deposited during Pamlico time. tion of the Pamlico shoreline. westward into Leon County it rises to 100 feet and higher (C. W.
it becomes about 7 miles wide. clayey sands that have been deposited on top of a limestone shelf. the stand of the Pamlico seas. lakes. It is believed these sand hills are Wicomico age deposits. being characterized by sand dunes lying upon a limestone surface. area mapped as the Gulf Coastal Lowlands (fig. 4). Jefferson County and is the largest stream in the county. The St.
a few miles through Jefferson County. lapse of the overlying sediments as an origin for the valley. the stream as sea level fell. River show up in the profiles at approximately 10 and 40 feet. the land surface to a degree that they are no longer apparent. Figure 7. Aucilla River at low water stage in Jefferson County, Florida. section 21, T3S, R4E to Nutall Rise the river flows underground. and many others are tributary to the Aucilla River. from the swamps, and is high in color. Welaunee and Cow creeks are tributary to the Wacissa River. has a meandering course that is oriented with dune development. plain of the river is very swampy and difficult to delineate. St. Marks in Leon County), Sweetwater and Moore branches. what is now Lake Miccosukee basin into the St. Marks River. emptied into the St. Marks River. into them from the lake basins in which they occur. travel is restricted to channels cut through the vegetation. basin is formed in the Oligocene Suwannee Limestone. place through the sinkholes in the lake region. are located 1 mile south of the town of Wacissa. depth of the pool away from the cavity varies from 2 to 5 feet. limestone in Jefferson County, Florida. in width, the dimensions of the other were not determined. heads because its outlet channel was obstructed by fallen trees. width and is full of eel grass and other aquatic growth. tion and the surface has a scum of "duck seed." feet in length and flows in an easternly direction. bottom 8 feet in diameter and in a maximum of 28.0 feet of water. to the floors of the cavities are 28.2 feet and 24.0 feet, respectively. and also in Little River. These were not investigated. head of the smaller spring. head of the spring (2.6 cfs, Dec. 7, 1960). Minnow Spring-5 cfs (3 mgd), estimated. would be difficult to measure. by fishermen, owing to the abundance of fish. northwest-southeast, exactly marking the crest of the anticline. result of the stream following fractures in the Suwannee limestone. linear trend mentioned above. Observation of the bedrock map (fig. geologic formations that occur in Jefferson County. tained from studying well cuttings, and core samples, figure 11. Figure 9. Linear trends in Jefferson County, Florida. Suwannee Limestone Jefferson County, Florida. TABLE 3. Geologic Formations in Jefferson County, Florida. part is taken from other sources. Figure 11. Well locations and lines of sections in Jefferson County, Florida. TABLE 4. Geologic data from selected wells in the Jefferson County area. ous, but little has been noted in the Upper Cretaceous units. Albian) there designated as Middle Cretaceous." Mesozic (personal communication, August, 1963). shales interbedded with quartz sands and limestone. Coastal-Larsh well is 3,155 feet. of peninsular Florida meet the Clastic facies of western Florida. into an "A" zone, which contains the Eagleford fauna, and a "B"
and lower members as originally defined by Applin (1947). present in the Coastal Petroleum, E. P. Larsh No. 1 oil test well. range in depth from 2,890 to 3,400 feet. Co., Larsh No. 1 oil test well in the intervals-2,510 to 2,560 feet. glauconitic, clay containing abundant microfossils. and Globorotalia, and Globototalia wilcoxensis Cushman. occurring in north Florida and peninsular Florida. unknown because of a sample gap from 160 to 925 feet. and the Crystal River Formation. p. 24) later raised the Inglis Member to the rank of formation. and the base at 880 feet, a thickness of 100 feet. was raised to the rank of formation by Puri (1957, p. 28-29). crystalline to partially recrystallized limestone (calcarenite). River Formation is 205 feet thick and occurs from 500 to 705 feet. for about 2 miles before turning northward and intersecting U. S.
the Aucilla River, Jefferson County, Florida. along the river, figure 13.
to the confluence with the Aucilla River, just above Nutall Rise. North of Cody Scarp the formation is covered by younger deposits. of Mexico off Jefferson County, shown in figure 15.
with CaCO3, with moderate to good porosity, and very fossiliferous. Chemically, it will approach 97 percent CaCO,. especially along the Aucilla River. Correction to Vertical Scale on Section A-t,. Sea Level is at the -40 interval. 2o SECTION A-A' -lr-120 . Figure 14. Geologic cross sections in Jefferson County, Florida. off the coast of Jefferson County, Florida. could be correlated in time with the Oligocene Marianna Limestone. likely represents the formation's maximum thickness. in southern part of Jefferson County, Florida. outliers of the Hawthorn Formation. identified from outcrops as well as well cuttings. surface in most of the southern half of Jefferson County. Figure 17. Quarry of Suwannee Limestone, Jefferson County, Florida. weakly to firmly with CaCOs, moderate porosity. inactive quarry that was dug around the year 1909. 1. LJf-4S-3E-16 ab: In a ditch beside a timber road. 2. LJf-4S-3E-17 bb: In a ditch beside a timber road. 3. LJf-3S-3E-27 dd: In a ditch beside a timber road. 4. LJf-4S-3E-22 ba: On the bank of the Penhook River. 5. LJf-4S-3E-15 cb: On the bank of the Penhook River. Limestone many rapids are present on the Aucilla River. adhere to the nomenclature presented by Puri. absent in part of the county. Limestone basin, but to the east the formation is missing. Miccosukee Formation. It appears from the elevation of the St.
eroded and removed from a large expanse of the area. described by Dall (1890, 1915) and Mansfield (1937). Jefferson County lines in secs. 19 and 30, T3S, R3E. orange, cryptocrystalline, hard, sandy limestone. Harris (1892, p. 107) for deposits exposed at Hawthorne, Florida. included all Miocene beds younger than the St. Marks Formation. subsurface over most of Jefferson County north of the Cody Scarp. instances the formation is covered by slump and is not visible. some coarse, clayey quartz sands that also contain phosphorite. associated with thin sandy calcilutite stringers. southern Jefferson County reaches a thickness of 50 to 70 feet. a basin and attains a thickness of about 240 feet. south of the bridge on State Highway 158.
light gray, very sandy, phosphoritic clay. to the Hawthorn beds exposed at the Cascades. Formation (Pliocene) by Matson and Clapp (1909). Lafayette Formation to the lower Miocene Alum Bluff Formation. Alum Bluff Group (Middle Miocene). a delta of "Hawthorn age." Formation by Hendry and Yon (1967, In press). lie above the Middle Miocene Hawthorn Formation. removed by Pleistocene marine erosion. clays and alluvial sands, and the presence of land vertebrates. sand; and montmorillonitic, kaolinitic, varicolored, sandy clays. present, but has been obliterated by the intense weathering. Pliocene) and post-lower Snake Creek (Upper Miocene) beds. medium grain size quartz sands. sands and also verticle joints filled with sandy clay. or sequence of beds that are different from any other outcrop. Locality LJf-3N-5E-31 aa: Roadcut on the east side of U. S.
Locality LJf-2N-6E-1 dd: On north side of State Highway 146.
sediments are confined mostly to the present stream valleys. to subrounded, clayey, quartz sands. thicken to approximately 10 feet. respectively, overlie the St. Marks Formation. been particularly rewarding for the skindiving bone collector. redeposited, and, in some cases, entombed in a reworked clay." become extinct before the close of the Pleistocene." animals in the vicinity of Lake Jackson in Leon County." the Ohmes' collection in Chaires." Bison bison (American "Buffalo" bison). Bison cf. latifrons (Extinct bison). taining very badly weathered macrofossils. lonitic macrofossiliferous clay similar to locality LJf-2S-3E-14-ac. well cuttings and gamma ray logs. draw in a fault along this trend, as subsurface data is lacking. therefore, not a true representative of the structural conditions. been penetrated in the subsurface by wells. Eocene, Jefferson County was in an area of plastic deposition. regression of the seas and its surface emerged and was eroded. youngest formation in the Ocala Group. the St. Marks Formation was deposited on top of the high areas. been formed prior to the encroachment of the early Miocene seas. in Jefferson County, especially in the eastern part, where the St.
lies directly upon the Suwannee Limestone. of deposition and the contact is probably a conformable one. the Gulf Coastal Lowlands in the southern part of the county. muck in the lakes and Coastal Marshes. the swamps near the Wacissa River, in southern Jefferson County. Indians to see the smoke. after year, they begun to speculate about its origin. was coming from a pirates den. swamp was smoking his pipe again. smoke was coming from a camp of run away slaves. newspaper man lost his life trying to solve the mystery. was no hoax and would be a permanent and persistent mystery. disappearance of the volcano to the Charleston earthquake. by fire surround the crater. show no evidence of volcanic activity in the area. more than silicified limestone residue of the Suwannee Limestone. more than a legend or a myth. Company for use as road metal in the southern part of the county. with draglines and front end loaders on tractors. technical data pertaining to uses of limestone. region. Two principal highways, U. S. Highway 90 and U. S.
the commodity to local consumers or to rail lines for shipping. to markets all over the State. Figure 20. Distribution of the economic deposits of Jefferson County, Florida. 'For a technical discussion of these categories see Florida Geological Survey Bulletin 42, p.
2See Florida State Road Department Standard Specifications 1959, p. 423.
you the amount of magnesium carbonate present. Suwannee Limestones that have been replaced in part by MgCO3. Florida State Road Department Standard Specifications. a very small percentage of sand and may be of commercial value. deposits suitable for commercial use. No. 2, (1949, p. 35, 54). Ditch on county road west of Thomas City. dusky red sandy, silty clay. as colloidal phosphate embedded in a clay matrix. TABLE 8. Tests of selected clay samples from Jefferson County, Florida. conditioner and filler in fertilizer. the earth in the zone of saturation. surface runoff in streams, by evaporation and by transpiration. fall. This water is said to be under artesian conditions. and public supply is derived. from Middle Eocene to Middle Miocene. the Hawthorn Formation and Miccosukee Formation. as well as seasonal fluctuation. cello, Jefferson County from 1948 to December, 1962.
departure curve shows a gradual decline. to December, 1962, has been downward. WJf-1S-3E-15-cd declined 3.92 feet during the same period. water table conditions rather than artesian. result of the decline in rainfall after 1960. 5 62 - . . .... . I 38 . ; - ; .- .. .
precipitation in Jefferson County, Florida. the Floridan aquifer in May, 1960. CONTOUR INTERVAL IS 10 FEET. the Floridan aquifer in December, 1962.
through the plastics overlying the Suwannee Limestone. secondary aquifer or that it is a water table well. Hawthorn Formation and Miccosukee Formation. levels rise during wet periods and fall during dry periods. well WJf-1N-4E-26-bb and is shown in table 9.
dissolves a part of the rock with which it comes into contact. through which it has passed. precipitation graph of rainfall in Jefferson County, Florida. and magnesium generally are the cause of hardness of water. from 68' to 710 F.
better the water conducts an electrical current. pH value greater than 7.0 and ranged from 7.9 to 8.4.
except it can contribute to the formation of scale in steam boilers. aquifer the silica content was 39.0 ppm.